This particular geranium had a beautiful dark variegation on the outside of the leaves. This was added with a brush-dance type of stroke (holding the brush straight up and down and using the point of the brush only), using a number 10 round brush with a good point and natural hair. I used Burnt Sienna for the color and I used it very wet. The water is what gives the variation in the values of the pigment. I painted this very wet onto the dry surface of the leaf. 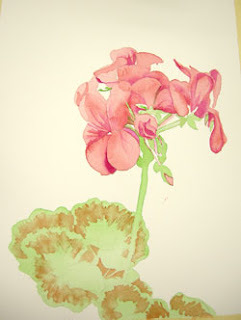 I also used the Burnt Sienna to create some tiny details in the shadows of the flower petals. This piece is moving along quickly!